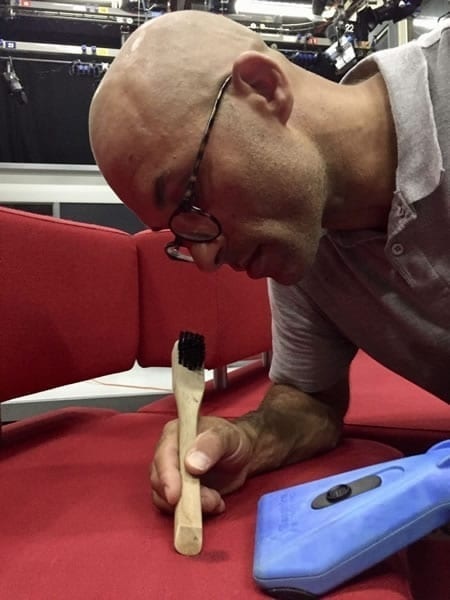 I’m looking for somebody that could remove a stain from a sofa in our studio – a baby wallaby had an “accident” on it and I’m trying to clean the sofa without leaving stains. This isn’t a regular occurrence, so we were fairly intrigued and called the customer back and arranged a survey. 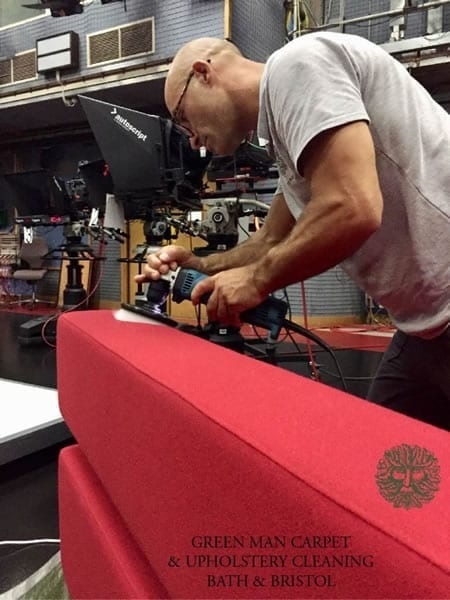 Our senior technician, Gareth, conducted the survey and devised a deep-clean that would sanitise the fabric, restore the sofa to its best potential condition, yet still be dry in around an hour. The studio in question was at the BBC Whiteladies Rd. studios, Bristol. During the survey, Gaz discovered that the particular studio we were to work in was where the original Johnny Morris Animal Magic series was filmed. It turns out that, over the years, all manner of monkeys, snakes and various beasts have disappeared and wreaked havoc in the building! 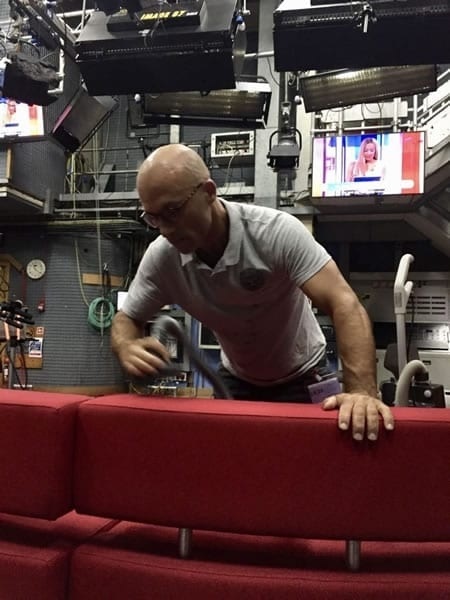 Once we had discussed the logistics of the job, we made arrangements to attend on a Sunday to allow a margin of error, should the sofa take an unpredictable amount of time to dry before the next edition of Points West was due to be filmed. We were given security clearance and entered the studio. A tv studio is crammed full of electronic equipment and therefore attracts a huge quantity of dust. 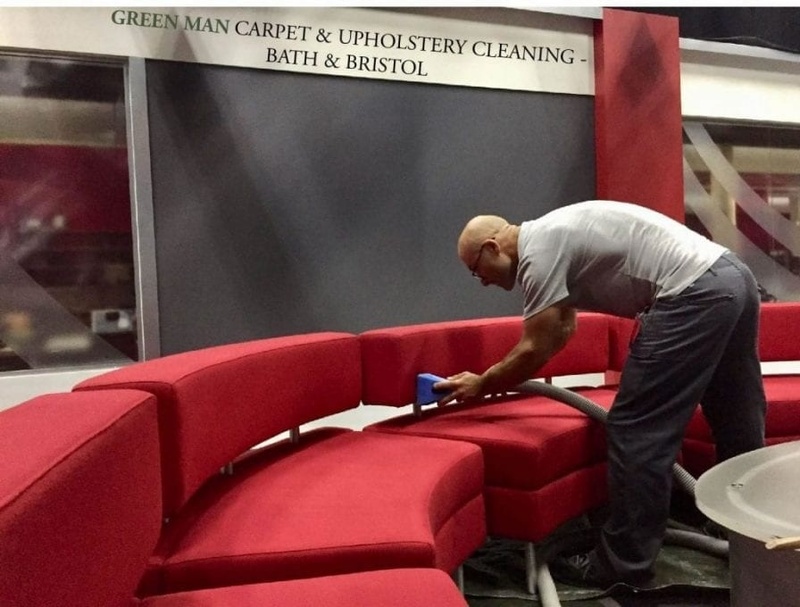 Any professional upholstery (or carpet) cleaning requires careful vacuuming as the first stage and, in this instance, it was absolutely essential. Professional sofa cleaning is about the removal of soils, grease & contaminants from the fabric. A significant percentage of the soils present in upholstery are able to be removed using a decent vacuum and a detailing tool. Without this primary stage, some of these soils actually become harder to extract because they may forced deeper by the rinse extraction process. Following the vacuuming, because this sofa is constructed of polyester, it was also shedding a lot of fibres. Close-up, this gave the impression the studio was inhabited by a long haired, white dog! These fibres needed careful removal by hand, so that the finished product would not only look clean, but also uniformly groomed. The next stage in the clean was to attend to any specific stains before wetting the fabric, as this can sometimes mask any problems by making them harder to spot. Because this particular sofa is constructed entirely of a synthetic crepe-type material, it was clear that there would not be any concerns regarding colour bleed or likely sensitivity to any of our solutions. I used one of our highly effective eco-solvents to break down several areas of sticky residue prior to the next stage of the sofa clean. Wallaby wee is clearly a hygiene issue, so the selection of a pre-spray needed to ensure that the fabric would be sanitised. Fortunately, Green Man carry a number of entirely environmentally friendly solutions that will sanitise as part of the way they work. The need for a rapid drying time narrowed down the choice and I mixed up a solution that works on contact and does not need to be applied heavily. We use a variety of large & small sprayers, many of which have a variable jet. This job only required a misting, so the nozzle was adjusted to allow for a controlled application of product. One of the key differentiators in how a professional will clean upholstery is in how they achieve a deep, even penetration of the cleaning solution. Without this, only a superficial clean is achieved. With fine fabrics, Green Man technicians will opt for a microfibre hand mitt to conduct this stage of the clean. However, on hard-wearing synthetics and large areas of upholstery, a motorised drill brush provides outstanding evenness, breaking up stubborn soils and greases. Once the sofa was fully prepared, it was time for a deep-cleaning rinse extraction treatment. This is more or less the main final stage of most professional carpet, rug or upholstery cleaning. Prior to this, all the initial stages have focussed on encouraging soils to detach from the fibres and breaking down greasy soils into a soluble state. Depending on the fabric type, upholstery cleaning can result in lengthy drying times. This is sometimes an uncertain variable, depending on fibre type, level of soiling, type of solution used and drying conditions. Because this particular clean was time-critical, it was important to use a modern upholstery cleaning tool that would rinse the fabric fully, without over-wetting. Pretty fascinating stuff, I’m sure you’ll agree. 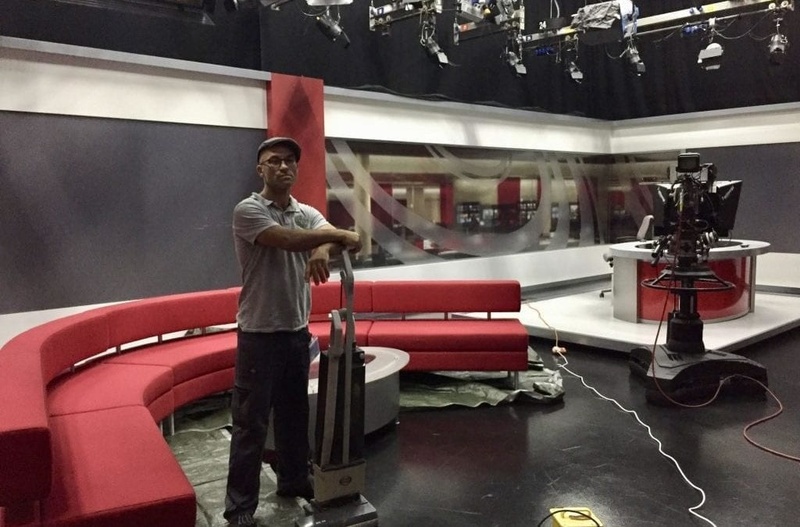 We had vacuumed, stain-treated, sanitised & deep-cleaned this bespoke piece of furniture within the time constraints of a busy tv studio and delivering a drying time that meant the sofa could be filmed on within an hour. Commercial chair cleaning – a brief case study.